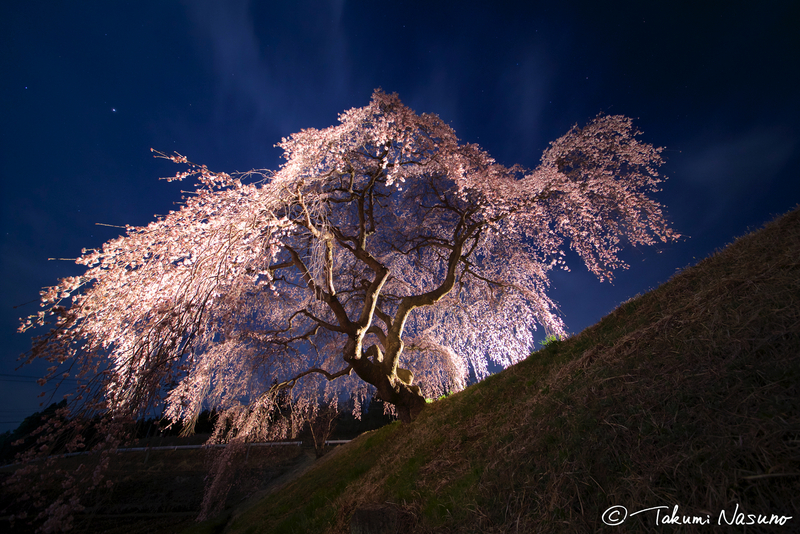 I have challenged to the Weeping Sakura Tree of Hanazono, Tanagura Town. This is the third challenge following after the first in 2015 and the second in 2017. I would like to reflect on the first and the second challenges before showing the third. 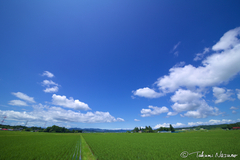 The first challenge was my first visit to Tanagura Town in 2015. 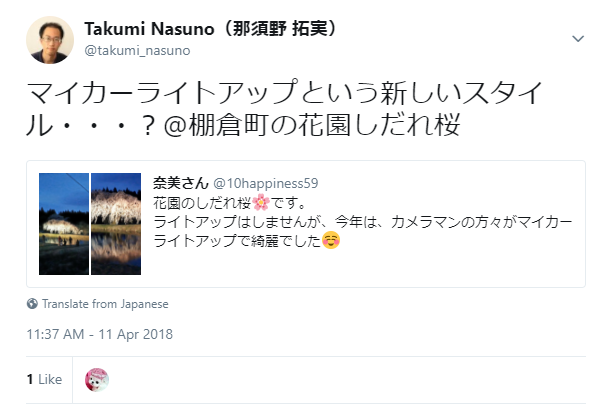 I heard from the manager of kura-cafe (the former shop selling products of rural areas) that Sakura trees of Tanagura Town are nice so I decided to to visit such an unfamiliar municipality of Fukushima Prefecture. 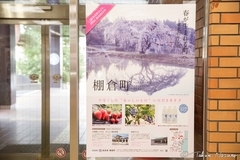 Later, this photo won the second prize in Tanagura Town Tourism Photo Contest 2015, and began to appear in posters and leaflets many times. (Check this post to see how this has been used as of March 2018.) 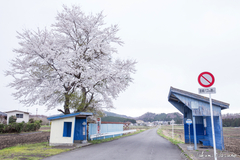 Plus, this photo was used in the would-be first newspaper and street ads of Tanagura Town for the Sakura season this year. →By the way, there seemed to be lots of so-called "my car lighting" this year. We shall enjoy it quietly only when the light does not bother others around us. And here the year of 2018 comes. I had been wondering what kind of my third challenge could compete with the first and the second because the two in the past gave me very impressive photos of different perspectives of the same spot. 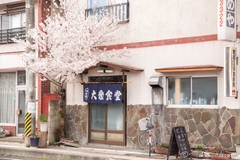 While time flied fast and Sakura began to bloom in Tokyo one week or more earlier than on average, I expected that the peak of Sakura blossoms in Tanagura Town would be around April 7. (The related post is here.) At that time, I started to find a certain possibility. "There might be a big chance at night in the rainy day...?" My intuitions told me that there would be no one around the Weeping Sakura tree of Hanazono under the rain in the mignight because night alone is enough to make people away. I was convinced that there must be a view nobody had enjoyed there before. On the very night of the Saturday, it didn't rain in the beginning despite the weather forecast of rain mark. I went back to the inn once to wait until it started raining. It became the next day, and it turned one o'clock in the midnight. And I heard the sound of rain over the window. There was no sleepiness and tiredness anymore. I was walking in the rain to seek for the view I imagined. There lied the Weeping Sakura tree of Hanazono in full bloom without anyone but me, which was perfect as I imagined and expected. The continuous rain was tapping the pond while the frogs were singing around it. 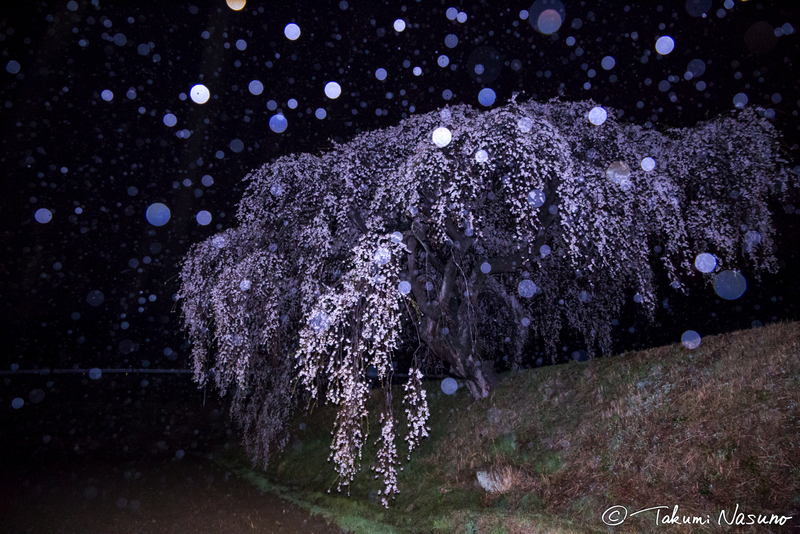 I hided and looked up the Sakura tree in the rain so that I did not stop the music. This photography can be successful if it manages to make you feel such a soundful view. 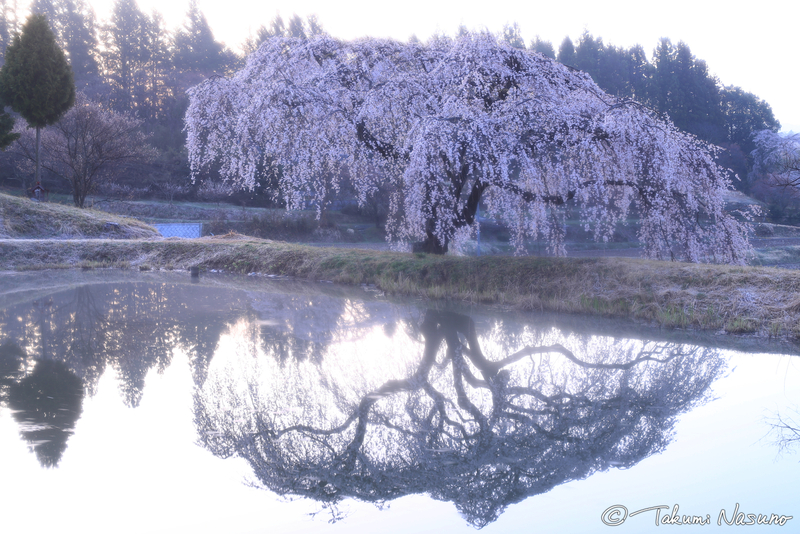 The Weeping Sakura tree of Hanazono has a great potential as one of the few single Sakura trees with its reflections on water. Then, I would like to end this post with my words as usual while hoping that Tanagura Town gets prosperous very well. 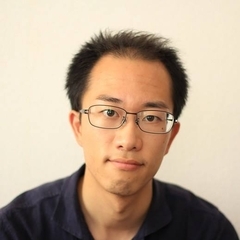 "I wish that more and more people get aware of Tanagura Town, and that any of them lead to the happiness of the residents of Tanagura Town." Caution : Night photography in the rain exhausts us as much as climbing so we shall recognize the geography in advance and prepare with the waterproof protection against cold weather so that we challenge it with safe. 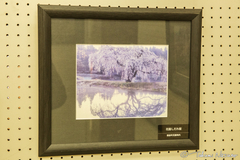 Thanks for using my photo of the Weeping Sakura Tree of Hanazono at Shinshirakawa Station Museum!